Free events in Berlin, this winter. EastSevens TOP 20! EastSeven made an amazing top 20 of events and museums you can visit without paying for it, nice :). 1. Topography of Terror – Back in 1987 a group of students excavated, with little more than their bare hands, the cellars of Berlins former Gestapo and SS headquarters. The Topography of Terror is the fruit of their labour, an open-air exhibition documenting what happens when a totalitarian regime tortures its people to death for fun. You can pickup a headset from the reception for English audio commentary. Next to the Topography of Terror is an excellent art museum called Martin-Gropius-Bau. 2. During the cold Berlin winter we like to provide our guest with a nice warm meal, every monday. It´s a Free Dinner Party for everybody staying at the hostel. Our cook Florian prepares delicious vegetarian meals, every week something different. Its a nice opportunity to meet up with other travelers. 3. Every sunday it is Fleamarket Day in Berlin. Close to the hostel (500 m)you find the Arkonaplatz Fleamarket and the famous Mauerpark fleamarket. You don´t want to buy something – no problem you first of all go there to see all kind of urban subjects with hangover and even sober ones. Berliners go there – you should as well. 4. The Sachsenhausen Memorial and Museum. Opening Hours in winter: 15 October until 14 March: daily 8:30 – 16:30 To get there, take the S1 (S-bahn Wannsee to Oranienburg) until Oranienburg station. This is the last stop and the journey takes around 45 minutes from Berlin-Friedrichstraße station. Trains leave every 20 minutes. You need an ABC-ticket. There is no entrance fee. Of course you pay when you want to take a guided tour, it costs €15 for up to 15 people, and €25 for up to 30 people. 5. Take the subwaytrain u2 from senefelderplatz to Potsdamer Platz – Potsdamer Platz was the glitzy centre of Germanys debauched 1920s metropolis, and the site Europes first traffic light system. Smashed into rubble during WW II, its now home to Europes fastest elevator and a mass of steel and glass buildings said to represent the future of Berlin. If you´re there you should definately check out the Sony Centre and Cinemax cinemas for films in their original language (e.g. English). 6. Also a most visit when you are in Berlin : Checkpoint Charlie. This is Berlins most famous crossing point between East and West and a lasting symbol of the citys fragile Cold War relations. Commemorated today by an ersatz replica of the original American checkpoint and two historically inaccurate pictures of Soviet and American soldiers. Do avoid the museum, its disorganised, expensive, and there is way too much information. 7.Reichstag – The German parliament building, re-opened in 1999 after the government and most of the ministries moved from Bonn to Berlin. British architect Lord Norman Foster redesigned this place, complete with a huge glass dome with public access, so you can watch the politicians at work. 8.The Berlin Wall Documentation Center is one component of the memorial site ensemble at Bernauer Strasse. The ensemble consists of the Berlin Wall Memorial, the Chapel of Reconciliation and Documentation Center. The Documentation Center is officiated by the Verein Berliner Mauer – Gedenkstätte und Dokumentationszentrum, which is supported by an advisory council and bears responsibility for the project content. The Documentation Center is housed in a section of the Evangelical Reconciliation Parish. The rooms, provided rent-free, are to be used for documentation and for an exhibition. NO entrance fee! Yeah! 9. Holocaust Memorial – Berlins ultra-controversial memorial for the murdered Jews of Europe, 2,711 concrete blocks jutting off at offensive and suffocating angles. Co-incidentally only a stones throw away from the site of Adolf Hitlers former underground lair, the Führerbunker. 11. Brandenburg gate. Every 10, 20 and 50 cent German Euro coin is minted with a picture of this big city gate on its reverse side. Stranded in a lonely no-mans land between 1961 and 89 thanks to the East German government, no other structure in Berlin better symbolises the temporary division of the city. Of course you should take your camera and get snapping; its not going anywhere anytime soon. 12. Organic market on Kollwitzplatz every thursday and saturday. On a late Saturday morning you should go to where the locals go – the farmer´s market on Kollwitzplatz – 200 Meters from EastSeven. Fresh organic vegetables, varieties of sausages and a lot more of savoir vivre. By your food of the season there, go back to the hostel and prepare it in our fancy self catering kitchen. Get out at U-Bahn Schönleinstraße. 14. Mauerpark – If you are over 20 and still like to play (particularly with beer bottles), then this is your playground. Its the best place in Berlin for relaxed outdoor boozing and there are hilltop swingsets which are a great spot for watching the sun sink lazily in the West. Dont miss the fabulous flea market on Sundays. 15. Visit one of the many christmas markets in Berlin. Most of them are free of charge. For instance the one at Alexanderplatz or the one at the Kulturbrauerei, the Lucia Weihnachtsmarkt. Go here for a stroll, shop to find some more christmas presents, drink mulled wine and eat german saucages! Nice. 16. Museum Island – Surrounded on all sides by the River Spree, Museum Island is literally an island with museums on it, isnt that clever? It is not only home to some of the citys top class museums such as the Altes Museum and the Pergamon Museum, but also the Berliner Dom and the tranquil Lustgarten. Visit the island on a Thursday between six and ten for free entrance to the museums. 17. Tacheles – One-time department store then SS headquarters in the heart of Berlins former Jewish quarter, the Tacheles was taken over by squatters in 91. Behind the buildings bombed out façade is a wealth of art studios, two cinemas, 3 bars, a beach bar, a café and a newly opened bourgeois restaurant. Watch out for the fire-breathing dragon in Café Zapata! Just opposite youll find delicious French fries served from a dodgy looking trailer called Beckers Fritten. 18. Art & antique market on Straße der 17. juni. Every saturday and sunday. Of course there is no entrance fee here aswell. The market is easy to reach with any s-train from platform 4 at Alexanderplatz. Get out at the stop Tiergarten. 19. Kastanienallee – Dubbed Casting Alley by the locals, this long strip of little cafes, indie fashion designers trading their wares and tasty restaurants is the ideal place to hang out and watch the surprisingly large number of beautiful faces walk by at all hours. Kastanienallee is home to Berlins largest and oldest beer garden – the Prater. 20. Zionskirchplatz – Life in a resistance group fighting either the Nazis or East German government was often a dangerous affair. Finding somewhere quiet and warm to hold your secret discussions therefore being a number one priority = PBergs 19th century Church of Zion. It is now surrounded by small cafes and restaurants. When you´re there go also to the Weinerei, where you can pay for a glass of wine what you think its worth. Okay, that´s all for now! Hope you have a great time when you visit Berlin. 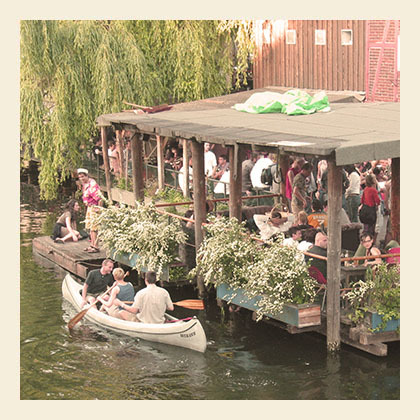 For more nice events in Berlin check our blog and our staff-recommendations.